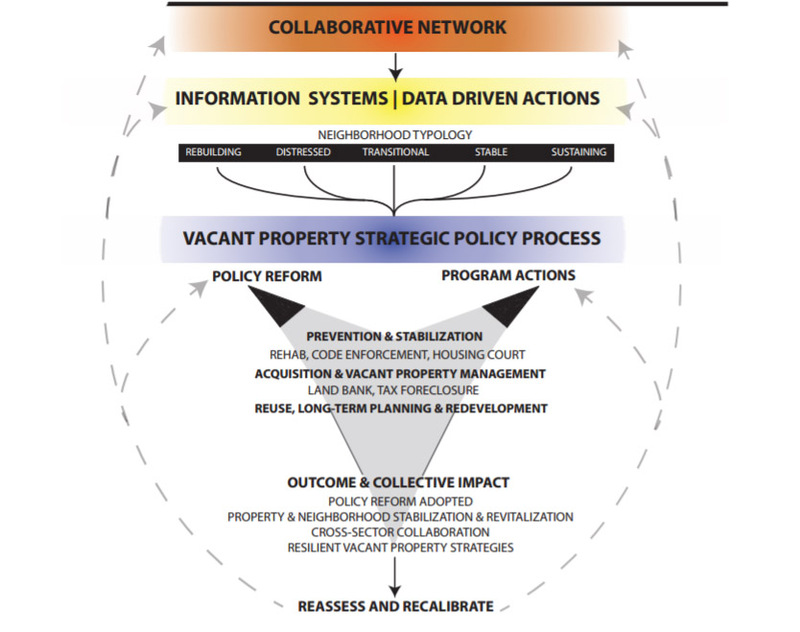 One inescapable and overarching conclusion arose from our years of research, field work, and convenings: Effective vacant property reclamation requires a policy system that can become adaptive and resilient to change. Most communities often respond to neighborhood decline and blight by launching individual initiatives or taking actions that only address one facet of blight’s complex dimensions. Given dwindling budgets and resources and the scale of vacancy and abandonment, communities do not have sufficient capacity or may not have the leadership to design and develop proactive and holistic policies and programs. Collaborative networks of public officials, nonprofits, businesses, and civic leaders, and community members: These serve as the initial catalysts to change and implement current policies and practices forging new partnerships and acting as stewards of their vacant properties agendas and initiatives. Real property information systems with data-driven actions: A resilient policy system relies on data to drive its decisions from policy design and neighborhood strategies to code enforcement actions. Communities often create data intermediaries that can curate diverse multi-agency databases and synthesize that information for local policymaker and community organization. Portfolio of strategic and responsive policies and programs that prevent, abate, acquire, reclaim and reuse vacant properties: These policies and programs include code enforcement, rehabilitation resources, land banks, and neighborhood and citywide urban greening, revitalization, remediation, and regeneration plans and initiatives.